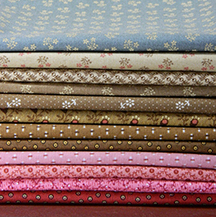 It is no longer economically feasible to keep such a large quantity of fabrics in stock as I have been for many years (because we are not thought of as a fabric shop and thus do not get the necessary traffic to justify the inventory), but since there is definitely a need for those hard-to-find tiny prints so necessary for dollmaking, I will be introducing new fabrics as mini collections (fat quarter bundles). These will change from time to time and is dependent upon collections being available to me when I can afford to invest in them. They may also be seen on the Garage Sale page. This has the quality of being drapey even on the smallest of dolls (meaning dolls that are about 2” tall) and has a vintage look when overdyed. This is a much loved batiste that I grew very fond of and used extensively for years until it was no longer available. After long searches and many yards of samples sent I finally found it. It is a bit more transparent than the regular fine batiste above but perfect for undies, garments with tucks and gathers and has even more drape. This extra fine batiste overdyes well if you want it to look old (or more off-white) and I recommend using my paint overdye* for this. Consider over dyeing any lace or other trims at the same time. It tucks well and even the tightest of gathers turn out beautifully with little bulk, so it is perfect for doll underwear, pinafores, bonnets or dainty tucked dresses. Lace dyed to match makes it ideal. Tips: Use deep colors of acrylic paints as an overdye for a rainbow of pastels or custom colors. Prewashing recommended. Semi-transparent, so plan to use an underlayer if to be used on an outer garment. Note: I tried regular silk taffeta, but not the same and really similar to the Medium Weight above with a bit more body. You may order this kind yourself in small quantities from www.dharmatrading.com (it is about $24 for full yard 55" wide).